Las Vegas Race and Sports Books are the next best thing to actually being at the stadium or track watching the action live, and, in some cases, even better. The famous Strip is always awash with players who try their luck on table games or a wide variety of video poker and slot machines. But as we can see from the ever-increasing revenues garnered from sports wagering; more and more gamblers are betting games. The most popular sport to bet on is far and away the NFL. We all know the money wagered on the Super Bowl legally in Nevada and illegally across the nation each year could fund a small country. The books here in Nevada alone handled over 90 million dollars worth of action on the ‘Big Game’. Choosing the right sports book to play in is often just as important as choosing your bet. So if you are planning a trip to Sin City, here are the must see Race and Sports Books. Number One on our list is the Wynn Las Vegas. The Wynn is the only casino resort in the world to have a Mobil 5 Star rating and an AAA 5 Diamond rating. Wynn Resort and Casino has become the cream of the crop when it comes to staying in Las Vegas with 2,716 luxurious rooms, fine dining, a luxury spa and, last but not least, a world class casino and sports book. 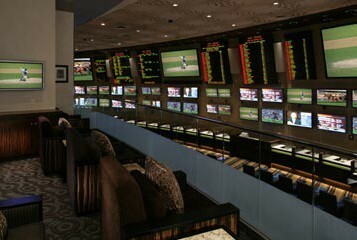 You will find the sports book has high-energy wagering in luxurious comfort surrounded by state-of-the-art technology. Live satellite broadcasts from all over the country and around the world displayed on three large screens and 30 plasma TV’s will keep you entertained and heading back to the window again and again. The Wynn also offers a full complement of wagering on all major sporting events. If you favor the ponies you will have the opportunity for unlimited pari-mutuel wagering on all premier horse racing circuits throughout North America and the rest of the civilized world. The oversized leather chairs provide the ultimate in comfort while high-definition plasma screens show every action packed moment. The very attractive and attentive waitresses will be more than happy to bring you a drink right to your seat if you don’t feel like ‘ponying’ up to the bar. I had the opportunity to sit down with Race and Sports Director John Avello recently to discuss the Wynn Race and Sports Book. The Wynn property has a new wagering technology called IPT (Interactive Player Terminals) that allows players to bet from the comfort of their seats. Avello stated, “It is so simple just open an account with us and then you can wager from your location without ever coming up to the betting windows”. The book has three large-screen TVs that are easily viewed from anywhere you wish to sit or stand which constantly provide live sports cover- age. Additionally, thirty plasma TVs are located throughout the room for your viewing pleasure. In another section of the book there are 100 seats that feature personal video monitors to watch your money in action. There are another 25 leather seats on the sports side with 60 more in the sports lounge. Management also reserves 20 VIP seats for their High Rollers. Betting limits vary by sport but John Avello and the Wynn have been known to take some of the biggest wagers in town, and they are the first book in Las Vegas to post odds on the Kentucky Derby, often months in advance. If you are a horseplayer and spending some time in ‘Vegas’, the Wynn should be first on your list of Race and Sports Books. Events subject to cancellation or change at any time without prior notice. There are dozens of reasons that make the Las Vegas Hilton unique, not the least of which is its fabled connection to the King: For the last eight years of his life Elvis Presley performed in the grand showroom. Pictures of the rock legend can be found throughout the Hilton’s gaming areas, and a statue of Elvis is located inside of the main hotel entrance. When the Las Vegas Hilton Sports Book opened in 1986 it helped usher in a new era of ‘megabooks’ in Vegas. It was the first of its kind, featuring more seats than anywhere else in town. Additionally, huge monitors kept everyone abreast of the action while many smaller TVs were scattered about the place. And still to this day, the Hilton ‘SuperBook’ is a favorite destination of both locals and tourists. The ‘Superbook’ has more than 400 seats overall with 100 in the sports side and offers 42 TV’s (28 giant projection screens and 14-50 inch plasmas). Complimentary cocktails are served for players in both the Race and Sports Book. Room, food and other ‘comps’ are available for rated players. Visitors to the city should note that the Las Vegas Hilton is located just off the strip, which is a bit of a walk or a short cab ride. The Hilton is home to the SuperContest, the best pro football handicapping contest on the planet and the twice-a-year Pick the Ponies horse-racing contest as well as other horseracing handicapping contests. Mondays during the NFL season, the Miller Girls are on-hand from 5 p.m. to 8 p.m. withgiveaways from Miller Beer, Dreamcards, TheSportspage.com and the Hilton. The Hilton offers an extensive array of future odds. You can wager on week one NFL games in May, bet season win totals before the preseason even starts and wager on who will be this coming season’s champion. The Hilton offers over 250 “Prop bets” on the Super Bowl alone. 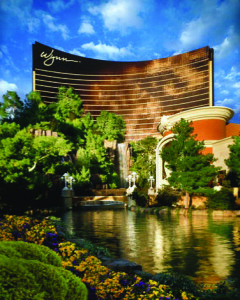 When it was opened in 1989 by legendary developer Steve Wynn the Mirage was the first major hotel-casino constructed on the strip since the early 1970s and an appropriate amount of fanfare greeted its arrival. A rainforest, an active volcano, rare white tigers and a dolphin tank were the main (but not exclusive) attractions. It is no surprise that the Race and Sports Book reflected the resort’s lofty designs. Even now the book lives up to the hype. Situated in the center of the Strip, this is the essence of a “destination” sports book. 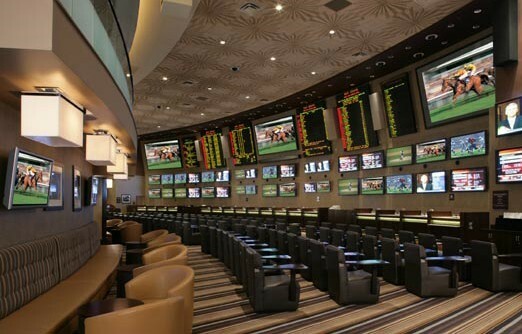 Built in the ‘superbook/megabook’ style it has a vast, expansive race area that sits adjacent to a more compact but still ample-sized sports book. As in most books of its kind, horseplayers get their own individual TV monitors, while large screens dominate both the race and sports sections. Betting lines that originate at the Mirage are disseminated to an all-star collection of satellite sports books, including those at the MGM Grand, Bellagio, Treasure Island and Mandalay Bay. At the Mirage you’ll find all the usual betting options, plus halftime and first-half lines, a large amount of money lines and match-up propositions, as well as special one-of-a- kind wagers that pop up from time to time. The Mirage offers betting lines and totals on WNBA games and is the only property in Las Vegas to hang numbers on every game in the NCAA women’s basketball tournament. If you are a high roller who routinely bets five, ten dimes or more (that’s Vegas talk for $5,000 or $10,000) at a time, your play can get you free meals at one of the many exclusive restaurants in the hotel. For the rest of us, we will have to settle for our favorite brand of beer or liquor from the book’s great staff that are always happy to cater to a bettor’s needs. Even if you’re a low roller, a visit to the California Pizza Kitchen (right off the book) is a worthwhile way to spend some down time between action. And right next door to the Race and Sports Book is one of the city’s most prestigious poker rooms. It is difficult to beat the Mirage sports book as a place to bet and keep up with the action, but on a busy sports weekend or during major events such as the NCAA Tournament or Monday Night Football arrive early, very early, if you hope to secure a seat. The Green Valley Ranch, a Station Casino’s property, opened a new state-of-the-art Race and Sports Book and an awesome Poker room last year to much acclaim and hoopla. The new book has 170 seats each featuring its own personal TV with great views of the 32 – 50-inch plasma TV’s strate- gically positioned around the room. The gem of all is an enormous 96-foot video wall, powered by 18 projectors that displays a crystal clear picture of the main sporting event of the moment. There are also 32 VIP chairs that allow you to place a wager on the ‘horses’ right from your seat. The large LED odds board is readable from all the seats in the back of the book and from the bar area. Taking a tour of the control room was very interesting to say the least. This is where the heart and soul of the Race and Sports Book lies. The employees control everything from the games that are viewed in the book to the odds that are posted on the betting boards. It is a remarkable combination of computers and hard working people that provides everything bettors need. said VP of Race and Sports Operations Art Manteris, who in the past seven months has opened the Station Casino’s new hub, Red Rock, and the new Fiesta Henderson Sports Book. The $110 million expansion includes 1,200 additional parking spaces in a new garage just a short walk away from the sports book. The new 22-table, 24 hour non-smoking Poker room is one of the best I have seen anywhere in town. Let’s not forget food. Two new restaurants, the Tides Oyster Bar and the Turf Grill, have just opened for your complete dining experience. Green Valley Ranch Resort, Spa and Casino are located at Green Valley Parkway and the 215 Beltway right next door to the shopping, arts and restaurant districts. Stations Casinos next big project will be a new property called Aliante Station in North Las Vegas. Since opening in December 2005, this beautiful property on South Las Vegas Boulevard (which will someday become the ‘new’ strip) was formerly known as the South Coast. It expects to benefit under the ownership of the highly flamboyant Michael Gaughan, who is prying the property from the Coast Casinos chain and will operate it independently. Why did this book make my list? It is not only large with plenty of seating (and booths), a surplus of TV’s and friendly staff; but most importantly the South Point is an independent book. That’s a big factor for us day-to-day bettors shopping point-spreads at major casinos owned by the same company using the same lines gets you nowhere fast. The Race and Sports Book has plentiful seating as well as a lounge area with televisions to give patrons a number of comfortable viewing options. The South Point is located in an area of town that continues to grow, both in business and residential aspects. This growth combined with Michael Gaughan running an independent book is a surefire recipe for success. With seating for over 300 fans and 17 big screen televisions, including a 28 by 30-foot projection screen, the Mandalay Bay is one of the most happening books in the Las Vegas scene. Located at the west end of the casino floor in this upscale south Strip resort the book is large but comfortable, open and airy. A wall bigger than a billboard features an electronic odds-board overloaded with betting lines and information along with enough big-screen TV’s to satisfy any sports bettor. There is a cross-section of people from all parts of the country here; you always have someone rooting for either side in a game. You will know when a team either scores or fumbles, because someone will be cheering with joy and someone else will be crying out in anguish and despair. The book is one of the most high-energy rooms in the city. The Mandalay Bay may be best known for taking a very, very large wager from former basketball player Charles Barkley on the 2002 Super Bowl. Barkley wagered on both New England plus the points and on the very generous money line number. If you remember, the Patriots pulled off one of the biggest upsets in Super Bowl history over the high-powered and heavily favored St. Louis Rams. The Mandalay Bay hotel-casino has hosted some of the prestigious high dollar boxing matches in Las Vegas in recent years and it offers serious sports gamblers some of the highest betting limits in all sports. You have to check it out. This old time casino located in downtown Las Vegas has been newly remodeled and is once again drawing big crowds. The brand new Country Club Style Race and Sports Book is a must see for anyone traveling to Olde Vegas. As with all important sports books you will find all major sports on the menu just like on the strip except with a little more charm and comfort. After the games are over dive into action at the Golden Nugget’s newest attraction, The Tank, a $30 million pool, complete with a 200,000-gallon shark tank, three-story waterslide and well-appointed cabanas! Aquatic adventurers can take the plunge through the shark tank on the one-of-a-kind waterslide. So there you have it, seven can’t miss sports books and many ways to entertain yourself (and make some money in the process). Stay sharp and see you at the window.